Schmidli is proud to announce that it will be expanding its scenic catalog and carrying on the legacy of a forerunner in the scenic design industry. We will now be offering the Sky Drop collection. Sky Drops was founded by Gary Lloyd in 1989. 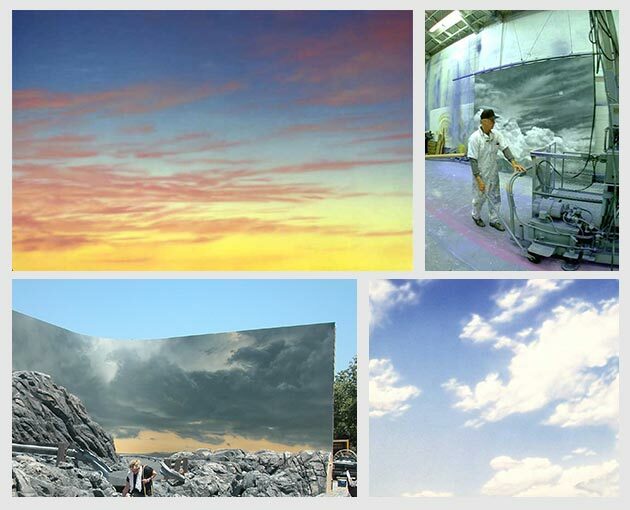 He is a master at painting trompe l’oeil skies; capturing the subtleties of light, depth and mood of a wide range of skyscapes, from ominous thunderheads to bright blue horizons, wispy clouds and golden sunsets. The largest painting to date spans 6 acres. His backdrops have been widely used in films, television, and still photography; including productions by Disney, Industrial Light & Magic, Paramount, Universal, Vanity Fair, Vogue and many more. To see the full collection in our catalog, search Gary Lloyd or Sky Drops under keywords. Also, please feel free to inquire about having a Sky Drop custom piece made either on-site or in the studio, projects of all sizes are welcome.